And it not just the press that are to blame. 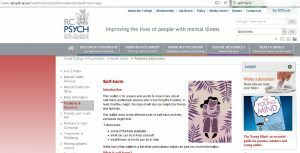 Government web sites as well as those for mental health charities also perpetuate the stereotypes, in the images they use. 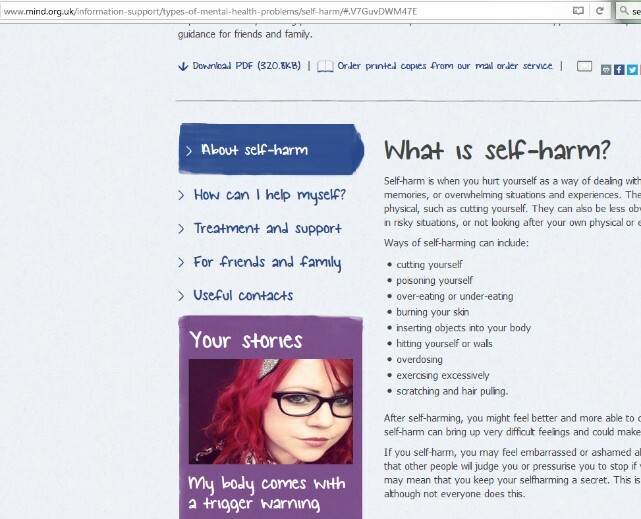 The NHS web site for example links self-harm with ‘Young’ mental health. 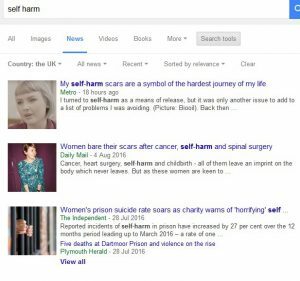 with Mind using an image of a young woman to illustrate its web site on self-harm. 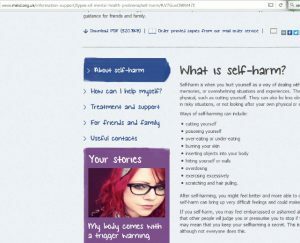 However the statistics do not seem to totally reflect this almost universal perception of people who self-harm being young and female. 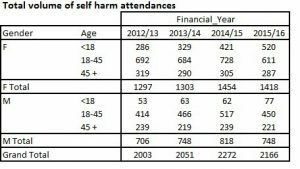 Again we can see that adult self-harm forms a significant proportion of admissions. 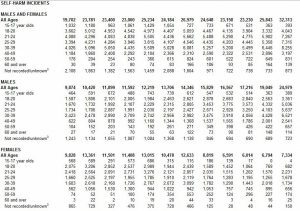 In 2015/16 17% of admissions for self-harm were aged over 45 with 38% of them being males. With 23% of attendees being over 45 in 2015/16 and 35% being male. Obviously those attending hospital may not for a total representative sample so I identified different data set, those self-harming while in Prison. We can see from these figures that in 2015 77% Males in 2015 and that 13% of them were over 40. 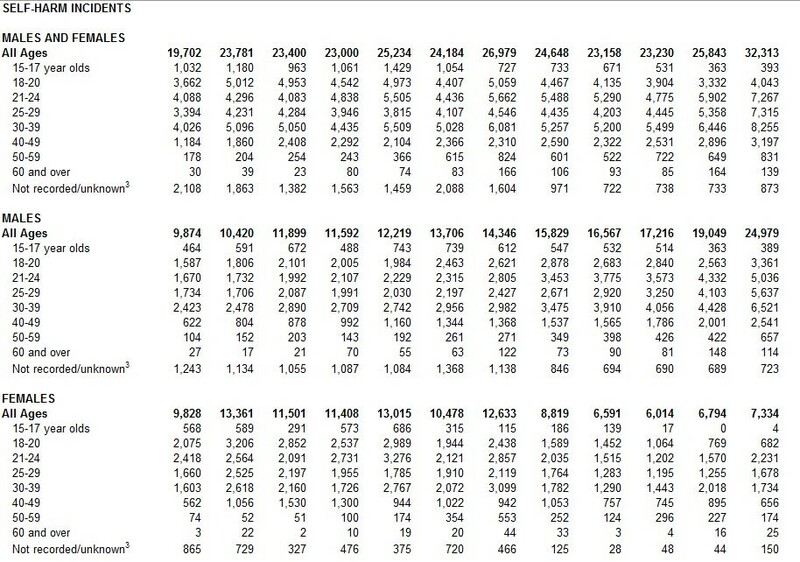 Obviously these figures are skewed but the relative numbers of males and female in custody, with males far outnumbering the females. Applying this correction gives us a result that just over 13% of self-harm in the prison population was committed by males. This figure is significantly lower than that seen in hospital admission but still a significant number. This may be explained by the differing nature of the prison population and regimes in place, but this would need further research to determine. 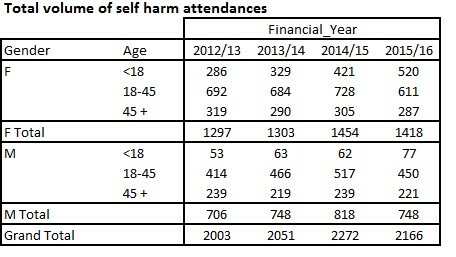 I think it fair to say that while the predominant population of Self-harmers are female and younger, late teens to late twenties the numbers of both male self-harmers and people in older age groups that self-harm are significant. It would be nice to think that the media would reflect this divers population but that is, in all probability a forlorn hope. 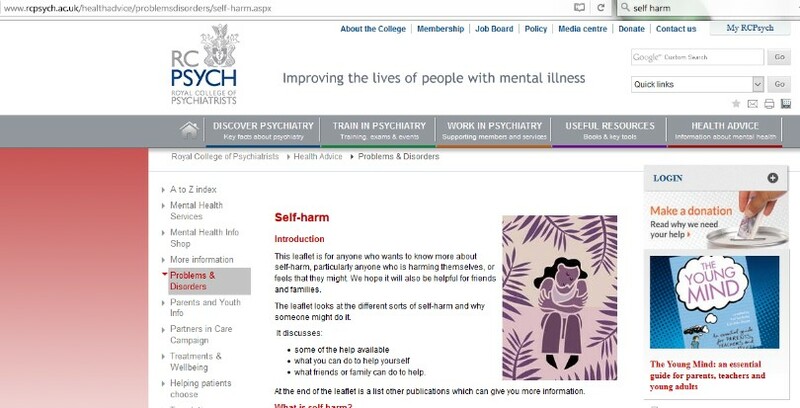 However it would be expected that the charities involved with people who self harm, as well as the NHS and other statutory services should recognise the range of genders and ages of the people who self harm in both their publicity, web sites and service provision.